Most flower lovers water their plants in the house with tap water. It is the cheapest and most convenient solution. 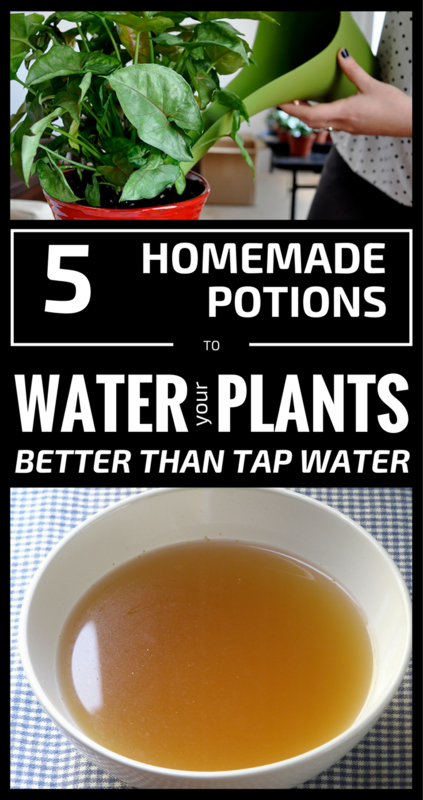 But there are other solutions, better than tap water, and some of them are easy to obtain, for you to grow wonderful plants. The thing is you don’t have to use these solutions daily, but if you use them once every 2-3 weeks, you’ll grow wonderful and healthy plants. Acidophilous plants such as ficus, orchids, African violets, or hydrangeas can be watered from time to time with natural sparkling water. It contains many beneficial minerals, which are not found in tap water. Potassium, magnesium or iron is essential for your plants growth. You can use a cup of mineral water every two weeks and the plants will thank you. If you are cooking various vegetables such as potatoes, carrots, peas or beans, don’t throw the water. Let it cool, strain the small pieces of vegetables and water your plants with it. The water in which vegetables had boiled is ideal for flowers and rich in amino acids and minerals that help to develop and flourish your plants. It is ideal for plants, but harder to collect if you don’t have a house. If you can collect rain water, strain it through a fine cloth and keep it in a cool place. Water your plants from time to time with rain water, and you’ll see how beautiful they’ll grow. But make sure that the water is collected in a pollution-free area, away from crowded roads or factories. Dilute chamomile, sunflower or lime tea with two or three parts of tap water and water your plants with it. In medicinal herbal teas, there are lots of acids and nutrients that are useful to your flowers. Make sure the tea doesn’t contain sugar, lemon or milk! Beer can be good for plants due to its high content of amino acids, carbohydrates and minerals. But you must use it twice a month and diluted only with 3 parts of water. Don’t pour the leftover beer directly on plants, because alcohol can affected the roots of your plants. Beer is only recommended diluted and poured to the pot’s edge to be filtered first by beneficial bacteria from the ground and then sent to the roots.